Great show, right? A modern classic, some would even say. But that doesn’t necessarily make it a good role model for your office. Allow us to demonstrate. Have you seen the episode where the office workers decide to start an office-wide weight loss initiative. Everybody tries (with varying degrees of commitment) to shed some pounds–and at the final count, the office weighs more than they did at the beginning of the month. Once again, not a good role model for your office. But here’s some good news: there are great, effective ways to run a successful work fitness challenge in your office. Want some fun work fitness challenge ideas? Keep reading! When it comes to living healthier it often is about the small changes. While it is great to commit to hitting the gym or revamping your diet, those more extreme changes can be difficult to sustain. Meanwhile, small changes can become habitual and have more of an impact than you think. 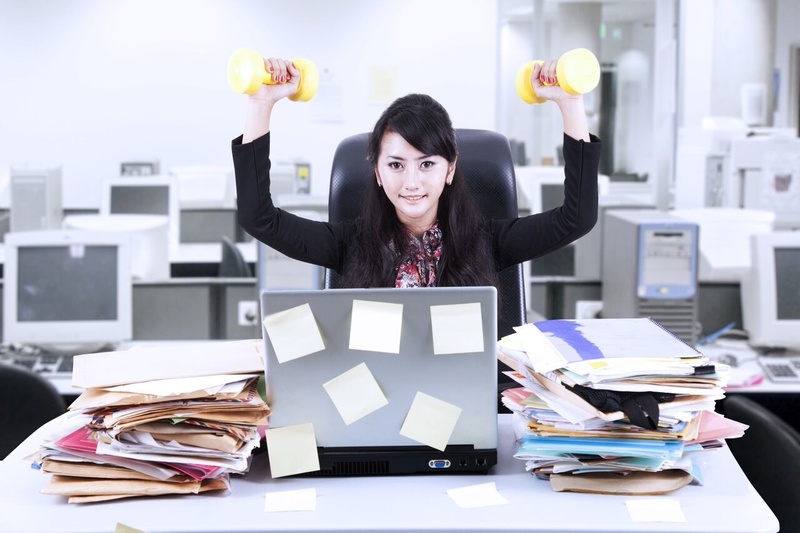 Instituting a work fitness challenge in your office could be a fun way to encourage some small changes that will make a big difference. This office fitness challenge is one of the easiest and most effective ways to get the whole team onboard and increase activity. It is recommended that the average person walk 10,000 steps per day–something 80% of the population fails to do. With a pedometer, your employees can track their daily steps and compete to see who takes the most steps. This is a great way to incentivize small increases in activity, like taking the long way to the restrooms. Those small changes add up! Charity walks or runs are a great way to encourage people to get active. Employees collect donations for the miles they walk or run and donate it to the charity hosting the event. Training for and participating in the event together is both great team building and an excellent way to improve employee fitness. Have employees pick an exercise of their choice–squats, pushups, jumping jacks, etc–to do every time they go to the coffee pot. Start off with a low number of repetitions, and gradually increase the number each day for this work fitness challenge. Use this company fitness challenge to encourage your employees to incorporate at least one serving of fruit or vegetables into each meal. Provide rewards and incentives to employees who meet the challenge for a given amount of time–weekly or monthly. Eating well is a crucial part of health and fitness and encouraging employees to make small dietary changes can raise energy levels and improve general health. Getting fit and healthy doesn’t have to be a drag. Competition and camaraderie between employees can make the process fun and exciting. Try out some of these work fitness challenges and watch your employees become energetic, healthy, and more involved at work! Contact Wellworks For You for more information on improving health and fitness in the workplace.